Ma had a special lesson on forgiveness to share with the twins, and decided that a perfect time would be when she usually read them a bedtime story. It was about both learning how to forgive others, and how to forgive ourselves when we make mistakes, or hurt someone's feelings. 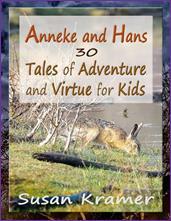 That evening after Anneke and Hans were settled down, Ma called them over to sit next to her on the couch, and she began to read her highlighted excerpts, "Jan was on the school playground and fell over a wagon that a classmate left on the running track." Ma continues, "It is better for Jan to forgive his classmate's forgetfulness, than to hold a grudge, and lose out on their friendship for a little while, or in the long run." And reading further, "Forgiving is both giving pardon and receiving pardon. These are skills that preserve peace and harmony." Ma then set the book aside and told the twins that forgiving ourselves for not being perfect is an important part of growing up to be responsible citizens, in friendships and at work. She said, "All through our lives we need to forgive ourselves for our errors in judgement, so we can go right on and try other ways of proceeding, and not get stuck in a groove of remorse." Ma reminded the twins that saying "I'm sorry" is the way most of us know to ask for forgiveness, especially when we've hurt someone's feelings or accidentally broken another's toy. Ma said, "It feels better to say the words and preserve the friendship than try to hide from what we've done. We forgive ourselves for our mistakes by changing our behavior in the future, and by realizing everyone makes mistakes and it does not mean we are bad." After listening to Ma talk about forgiveness, and then each dunking bites of a gingerbread cookie in milk, Anneke and Hans brushed their teeth and slowly trudged up the stairs to bed. Along the way they paused and reflected to each other that sure enough, forgiveness was a skill they wanted to learn so it would become a habit. With that in mind, they decided to practice right then – Anneke's bedroom was on the second floor and Hans' room was up a story under the eaves. As Anneke went into her room she turned out the hall light, leaving Hans in the dark. Then after a couple of seconds, she turned it back on calling up to Hans that she was sorry to leave him in the dark while climbing the stairs. He shouted back to her that he forgave her, and they both went into their rooms smiling, feeling like they had just learned a little bit about forgiveness firsthand.